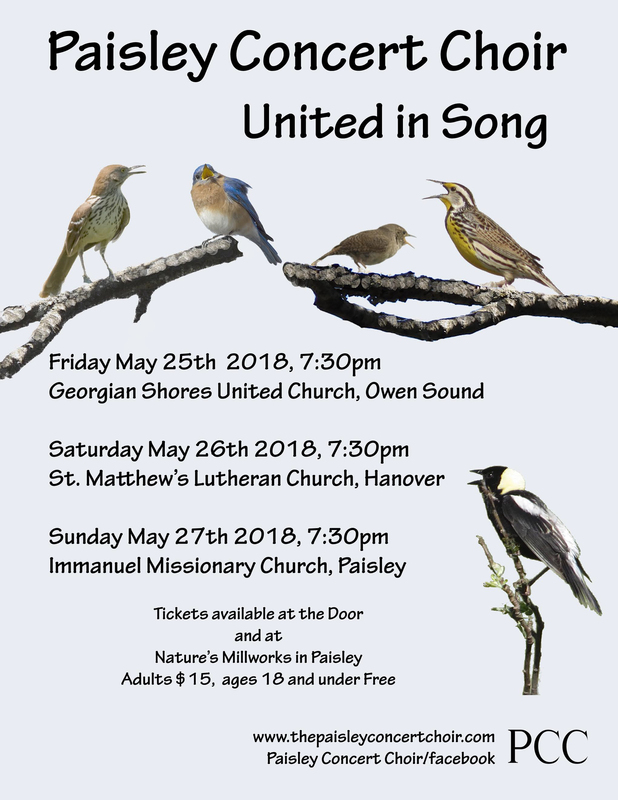 For its Spring 2018 Concert, the PAISLEY CONCERT CHOIR will perform “United in Song,” an eclectic mix of traditional, sacred and contemporary music which will unite the audience and choir in their shared enjoyment of the power of song. Concerts, under the direction of Linda Finlay and accompanied by Jane Siegel, will take place on Friday, May 25 at 7:30 p.m. at Georgian Shores United Church, Owen Sound, Saturday, May 26 at 7:30 p.m. at St. Matthew’s Lutheran Church in Hanover, (Please note the change in days and times for our first two venues) and Sunday, May 27 at 7:30 p.m. at Immanuel Missionary Church in Paisley. Some program highlights include a medley of Stephen Foster favourites, the rollicking spiritual, “Hail Holy Queen” from the movie, “Sister Act,” the hauntingly beautiful, “I Dreamed of Rain” as well as our title piece, “United in Song” which features piano four hands with Jane Siegel and John Todd. The skills of the tenors and basses will be featured in their rendition of the Irish folksong,“Carrickfergus“ while the sopranos and altos will shine in Bach’s “Bist Du Bei Mir“ in the original German. Small group performances by members of the choir will round out the program. Tickets are available from choir members or at the door before each concert. Tickets are $15. Children 18 years and younger are free of charge. For additional details, visit our website: www.paisleyconcertchoir.com or find us on Facebook.